A new sock adventure! That's a 9 inch circular, size 0, with the beginnings of a toe in Vesper sock yarn for the man. I've been a fan of two socks on one circular, but was intrigued by the quicker knitting possibilities of one tiny circular. My fingers feel a little crampy, which hopefully will cease farther along the learning curve, but so far so good otherwise. Knit on! The little man is almost 7 weeks old and settling in wonderfully to our little family. His sister is AWESOME and totally over the moon about his arrival. We are blessed! These would be Square mitt potholders using the recipe from the Bolt Neighborhood blog. Super quick and easy. I did forget to add a hangy thingie to one, but details-schmeetails, it's all good. One-third of a yard of fabric (I purchased mine from Hart's up the street) will make two potholders, and I scrounged through my stash for the rest of the requirements. A set of awesome and actually useful gifts for less that $7 — sweet!! The Bolt Neighborhood blog has been posting some really great holiday gift suggestions over the past few weeks. 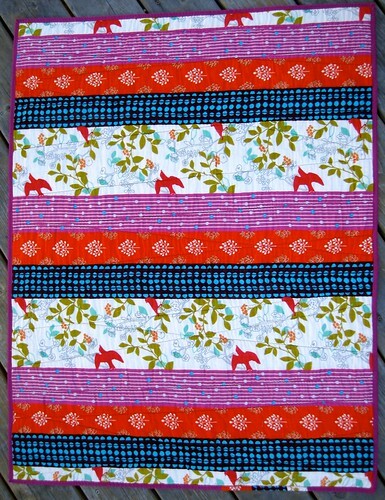 It also inspired me to make a set of placemats from scraps and stash, which are in progress (pics to come). We drove to my folks' last night for the holiday weekend, so I'm lounging around, still in my PJs while my husband and brother (who are "in charge" of Thanksgiving dinner this year) are off doing shopping for a deep fried turkey with all the trimmings. My mom offered to make our family's traditional chestnut stuffing, and I've been tasked to make an "experimental" stuffing. I'm going to try this apple, sausage, and parsnip stuffing. I heart stuffing (and parsnips and apples and sausage) so my fingers are crossed for a successful experiment!!! Happy Thanksgiving everyone! Getting my Christmas on!! (trying to anyways). I'm lovin' on the mug rugs! I dug through my stash and found some gorgeous natural Aiden linen and a few Momo Wonderland charm squares that I've been hoarding from my stash. This baby is about 5 by 8 inches total. Each square was supposed to be 1 inch but ended up a little smaller. I tried the "quick piecing" method for the first time as summarized here at Sew Mama Sew, and I think it sucked up more than 1/4 inch when I seamed due to the added thickness of the interfacing. It sure was easy though! No keeping track of all the little squares and their layout was a huge bonus. I didn't have a good match for the binding in my stash, so I pieced it from the charm squares as well, which was fiddly but worth it in ultimate cuteness. Next time I'll be less lazy and sew the binding segments together on the bias to avoid the seam lumps. 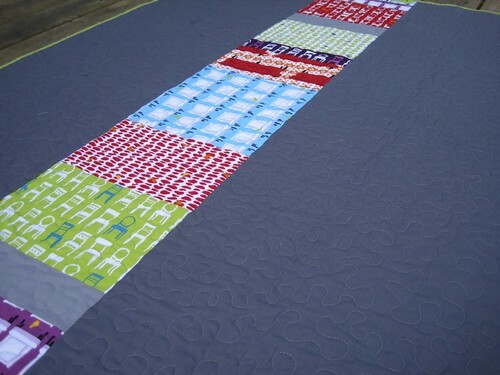 And in terms of the diagonal quilting, I don't love it, but it was easy and quick, and if I didn't do SOMETHING, it would still be sitting around half finished. The husband saw me working on it last night, was intrigued, and now demands one of his own. We shall see!!! I've had this baby quilt in the queue for a while, and now that the baby is here, I finally got around to pulling it together. This is my first whole cloth quilt, and clearly, the fabric makes all the difference. So gorgeous!! It's Echino Birdsong in natural for the front, which is a cotton/linen blend, and Echino Bird and Berry (an oh so soft double gauze) for the back. Le sigh. 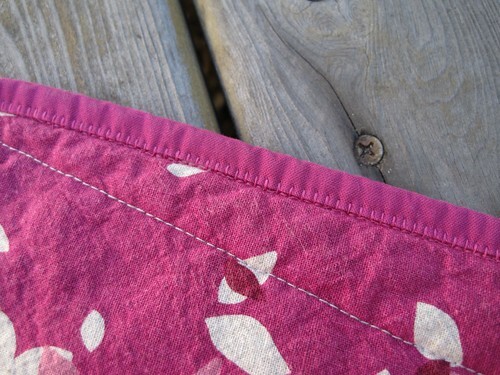 I quilted it very simply, with a few straight lines across, and bound the edges with Kona cotton in Cerise. 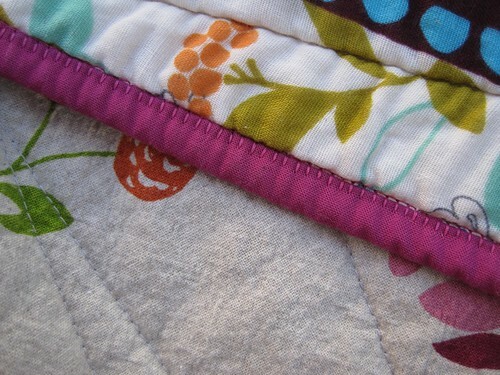 I usually hand sew my bindings using caro's awesome mattress stitch-esque finish, but with this quilt tried machine binding for the first time. Using a blanket stitch (stitch #43 on my fancy-to-me Bernina that usually never sees anything but straight stitches!) and following a tutorial from Pat Sloan that I saw on whipup.net, I gave it a shot. It turned out pretty well, much definitely faster than doing it by hand, but for sure some room for improvement. Next time I'll have to be a little more aggressive with the trimming of the edges after attaching the binding. Those were the only areas where I had any little wobbles -- where the binding edge was a little too "full" of front, batting and backing. But overall -- Yay!! It's been a while since I've used a sewing pattern requiring tracing, and relearned/ remembered a few things while busting out the Everything Tote from Weekend Sewing. Soil separator paper works really well for tracing patterns. It's a bit thin, but fairly strong. None of the pencils I could find work well on soil separator paper -- too much drag. Sharpies are too messy. Washable Crayola felt tipped markers (yes, I have a four year old in the house) rocked it. They dried quickly (no smudging) and were easy to clean off my quilting rulers (and my table, and my hands,...). Just remember to use a light hand or the marker ink will soak through to the original pattern sheet. The rocks I crocheted a few weeks ago worked great as weights while I was tracing my lines. No pinning required, quick and easy! 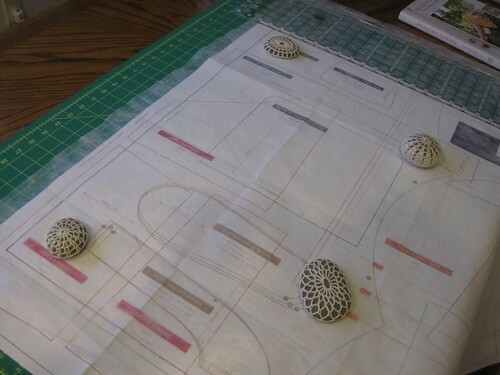 If you think you'll be using the pattern multiple times and want a sturdier pattern piece, it's really easy to transfer the pattern from the soil separator cloth to a heavier paper. Just lay the soil separator pattern on top of the heavier paper and trace with a washable marker. The marker ink will mark through the thin soil separator paper making clear tracings on the heavier paper. Tracing a pattern was much MUCH easier that I remembered. No excuse not to bust out the Japanese sewing and Ottobre Design books now! 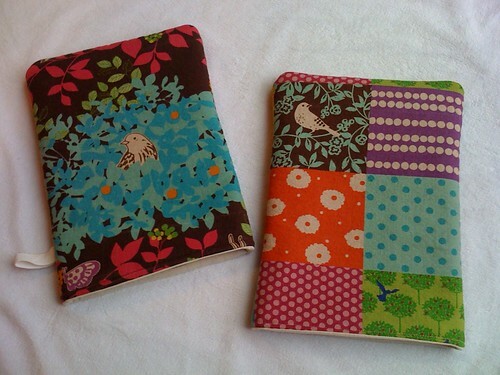 tufted tweets quilt and tote done! 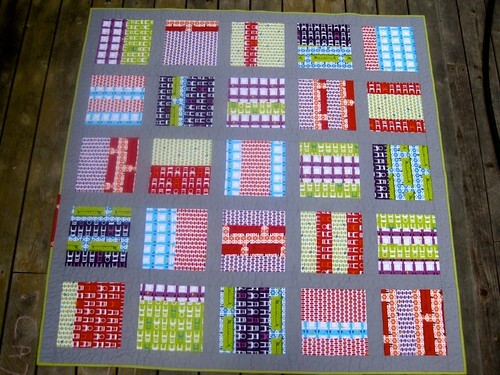 The happy birthday picnic quilt is finished, finito, done Done DONE!! 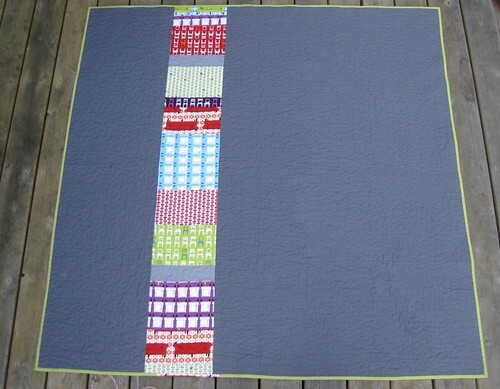 The quilt layout if a riff on Oh Fransson's Mixtape quilt pattern. I modified the pattern to fit a 25 block format with each block measuring nine inches square. The finished size is around 60 inches. 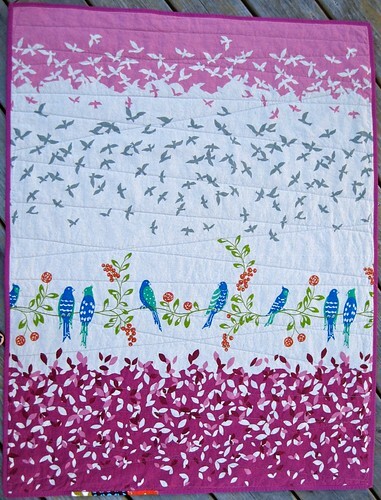 The fabric is Laurie Wisbrun's Tufted Tweets collection purchased from Fresh Squeezed Fabrics. Isn't it just fantastic?? Big heart for this line -- so happy! I made an effort not to be overly picky about cutting the pieces perfectly, but must admit to recutting a few of the particularly wonky block components. I went back and forth on the sashing color, and settled on Kona Cotton in medium gray. 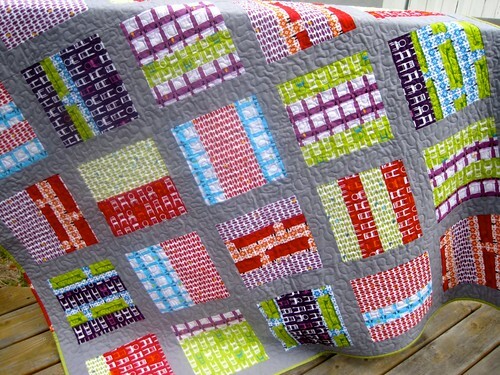 The quilt is bound in a green pinstripe fabric that I thought was from the Nicey Jane line from Heather Bailey, but that doesn't seem to be the case since I can't find it anywhere online Punctuation by American Jane for Moda in Tutor Stripe Green. I kept the back simple, and used Kona Cotton in Coal -- a little darker than the front to (theoretically) hide grass stains. I free-motion quilted this baby in medium-ish meander (while watching Buffy season 4 on netflix watch instantly -- woohoo!) using Aurifil 50 thread that matched the sashing. 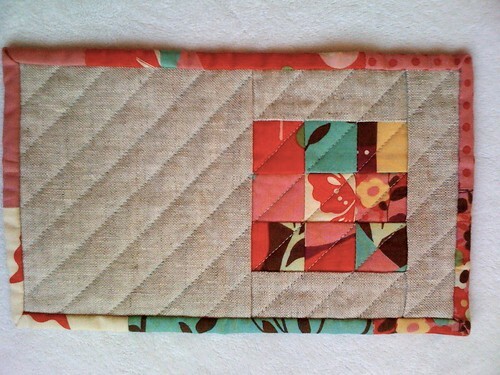 My free-motion quilting is getting better (knock wood). I think I have almost figured out how to avoid little jogs and wiggles when I stop and start -- it seems I have to stop/start stitching while I'm sewing the quilt away from me, not while moving sideways or bringing the quilt towards me. 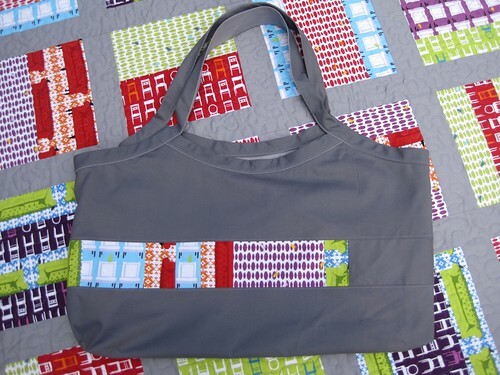 Since this is supposed to be a picnic quilt, I also made a little tote to match. 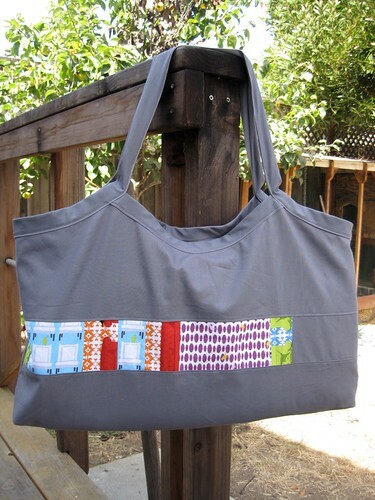 The pattern is from Heather Ross' Weekend Sewing book, and is called the Everything Tote Bag (as I mentioned in my previous post, check the errata!). I pieced a few scraps to make the detail on the front, and used the Kona cotton in Coal for the outside and Medium Grey for the lining of the bag (both left over from the project). It's pretty light duty, but I really like it. I hope there's still enough weeks of good weather left for my friend to enjoy her gift! 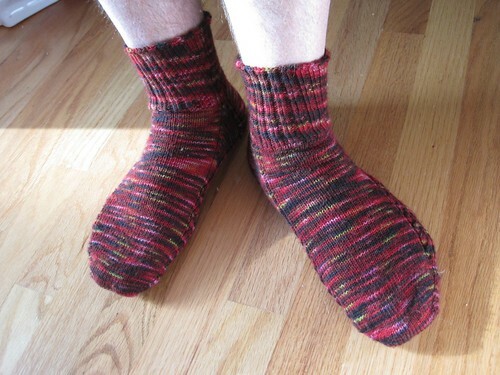 Brainless sock by Yarnissima (free on Ravelry). Adapted for my man's size 10 feet and my yarn of choice -- Abstract Fiber Super Sock in the Portland colorway. Knit two at a time on a size 0 (2mm) Addi Turbo needle. I used the awesomely awesome Toe up! book by Chrissy Gardiner to recalculate the timing of my gusset increases and such, as well as the shoe size / foot dimensions chart from Charlene Schurch's Sensational Knitted Socks for sizing info (my man was abroad when I cast on), and they fit great! This sock pattern and Chrissy Gardiner's master number worksheets won me over to toe up socks -- I am now totally a convert. And knitting two socks at a time ends my fear of second sock syndrome. I used one long circular for this project, which was a hugely bad call. Due to the cable detail running up the side of the sock, the pattern required shifting stitches around a bit -- a gigantic, epic pain on one circular. 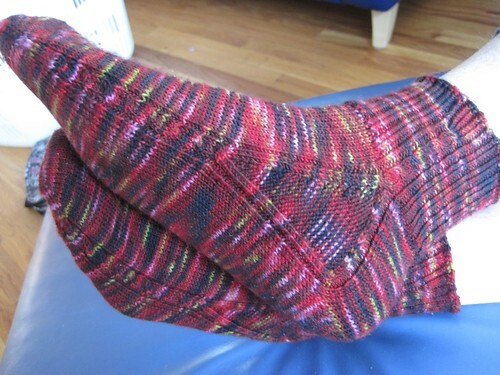 I'll use two socks on two circs when I knit this pattern again. I also think that next time I make socks for my man, I'll cast on a few less stitches for the toe -- these came out a tiny bit too boxy -- who knew he had pointy elf feet?? This was my first time trying the Abstract Fiber sock yarn, and I'm a huge fan. 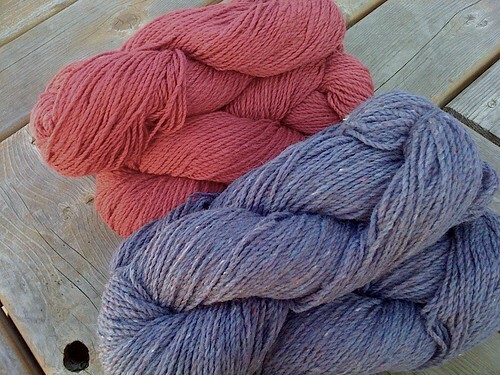 I believe I bought this skein from their booth at Madrona back in February. The gauge is just right (not too heavy or too fine), and the pooling is minimal! Abstract Fiber and Shibui use the same base for their sock yarns, and even though I love the Shibui semisolids, their tendency towards pooling irritates me. Next up (I've already cast them on!) spiraling Coriolis socks from New Pathways by Cat Bordhi, with Abstract Fiber Super Sock in the High Desert colorway -- yum!! I'm hardly a big crocheter, but when I saw the tutorial at the purl bee for crocheted stones, I had to give it a shot. I didn't actually use the stitch pattern given in the tutorial, but rather the technique. These patterns are from free doily patterns on Ravelry that for whatever reason spoke to me. 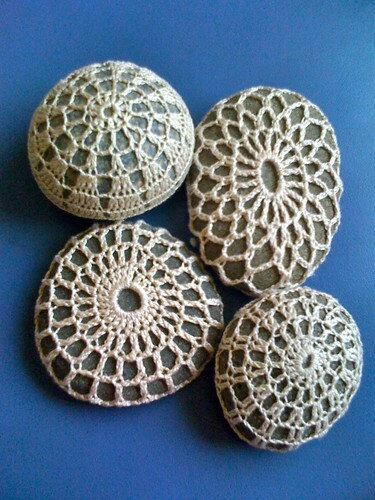 The rock on the upper left was crocheted with size 12 pearl cotton, the others with size 8.